Jeld-Wen doors are the nation’s leading manufacturer of fiberglass entry doors and steel exterior door systems, and are the preferred brand of entry doors by Sierra Remodeling & Home Builders. Our extensive product offering encompasses a variety of exterior and interior doors. For the exterior doors, we sell Jeld-Wen insulated steel, fiberglass and composite doors in smooth and wood grain. In the interior, we offer the 1 & 3/8″ hollow-core wood and formed doors. Also, Sierra Remodeling sells an engineered wood core interior door for more privacy and better stability with environmental changes; think Southeastern Arizona monsoons! Router-carved panels provide definition, contemporary and traditional sticking profiles add detail, and the seamless surface is made for easy painting. All of the Jeld-Wen products have a 10-year warranty. We have chosen to partner with Jeld-Wen because we are sure they produce some of the best interior doors for your Southeastern Arizona home. Through this relationship we can offer you many different styles of doors. Some of these styles are; all panel, glass panel, bifold and louver. 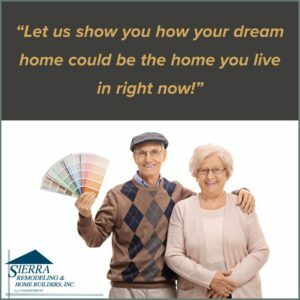 Sierra Remodeling will Invite style into every room! Accentuate your home’s decor in classic American style with MODA™ Collection interior doors from JELD-WEN. Known for simplicity and clean lines, the MODA™ Collection offers an even richer and more complex breadth of interior doors with the introduction of new panel options.